New Delhi: Patna Pirates and Tamil Thalaivas played out a thrilling 35-35 tie in Pro Kabaddi League encounter in New Delhi on Friday. Tamil Thalaivas would be the more disappointed side as they had the chance to win it twice in the dying seconds. Ajay Thakur was the star man for Thalaivas once again and scored 16 points. Pardeep Narwal got his 11th super 10 of the season and ended up with 11 points. 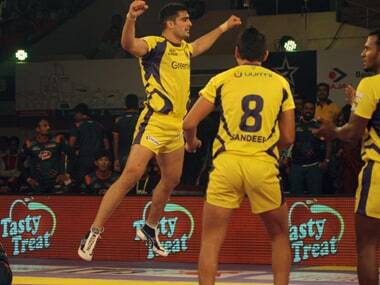 Manjeet Chhillar scored five points for Tamil Thalaivas and was ably supported by D Pardap (4 points) in defence. Thakur and Pardeep got their teams up and running to make it a score of 3-3 after 4 minutes. Thakur made a two-point raid in the 6th minute to give Tamil Thalaivas a 6-3 lead. Deepak Narwal scored two points in a minute as Patna Pirates leveled the match at 6-6. Patna Pirates then went on a little run as they inflicted an all-out to lead 13-8 after 13 minutes. However, Thakur was in great form as he picked up three more raid points to keep Tamil Thalaivas in contention. Patna Pirates led 16-14 at the end of the first half as there was little to choose between both the teams. Tamil Thalaivas began the second half with a bang as Thakur’s excellent raid led to an all-out. Tamil Thalaivas led 22-19 after 24 minutes as the momentum of the match shifted in their favour. But Manjeet picked up a couple of raid points as Patna Pirates reduced the gap to two points. A super tackle in the 28th minute meant that Tamil Thalaivas led 25-22. Pardeep had a quiet game by his standards as in the first 30 minutes he scored just five raid points. Manjeet Chhillar forced another super tackle in the 32nd minute to give Tamil Thalaivas 29-24 lead. Pardeep Narwal made a successful raid in the 35th minute as Patna Pirates inflicted an all-out to lead 30-29. Jasvir Singh’s two-point raid in the 37th minute brought Tamil Thalaivas back into the lead. 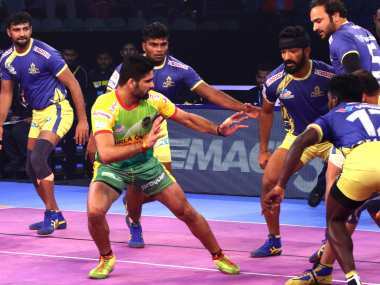 Pardeep made an excellent two-point raid in the 39th minute to give Patna Pirates 34-33 lead but Thakur returned the favour to give Thalaivas 35-34 lead. Pardeep scored a critical point in the dying seconds of the match which resulted in a tie. Meraj Sheykh put in a fine show to guide Dabang Delhi to a convincing 48-35 win over Jaipur Pink Panthers. It was a solid performance from Delhi as Meraj Sheykh (15 points), Naveen Kumar, (9 points) and Chandran Ranjit (9 points) combined to score 33 points. Jaipur Pink Panthers never recovered from a slow start and just couldn't handle the intensity of Delhi's performance. Deepak Hooda produced a terrific raiding performance and scored 20 points but his effort went in vain as he just didn't get enough support. Sheykh got Dabang Delhi to a flying start with super raid in the first minute. Deepak got a couple of raid points as Pink Panthers trailed 3-4 after three minutes. Naveen then made a two-point raid in the 4th minute to give Dabang Delhi a 6-4 lead. The hosts then switched gears with Sheykh producing another super raid in the 11th minute to help Delhi led 15-7 after inflicting an all out. Three minutes later, Dabang Delhi inflicted another all out to grab a 25-8 advantage. Pink Panthers' defence had no answer to the raiding prowess of Sheykh and Chandran. They could score just one tackle point in the entire first half. Sheykh got a super 10 in the first half as Dabang Delhi enjoyed a 19-point gap and led 29-10 at the break. Delhi began the second half with a bang, inflicting another all out in the 23rd minute to lead 33-11. Ravinder Pahal and Joginder Narwal marshalled the Delhi defence brilliantly and didn't let any Jaipur raider settle throughout the match. Pink Panthers' captain Anup Kumar too had a quiet match by his standards. The visitors salvaged some pride in the second half, scoring 10 points in the first 10 minutes but still trailed 18-36. Ajinkya Pawar scored with a two-point raid as Pink Panthers inflicted an all out in the 32nd minute to trail 23-36. 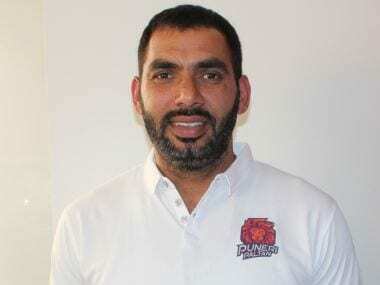 Chandran got a two-point raid in the 36th minute to thwart any hope Jaipur had of a comeback even as Deepak kept picking raid points, including a super raid in the 40th minute.